The wood frog is a broadly distributed small northern specie of frog that can grows up to a length of 5 to 7 centimeters a nd found in Canada in every province and territories excepts for the extreme northern parts of Quebec, Labrador and Yukon. Wood frog are coloured in ranges of grey to reddish brown with a white underside and dorsal white line in most of specimens. Wood frog have some dark brown markings on the side and also arbore some dark colours on their back, chest and throat. Female can be distinguished from males by their slightly redder colouration. The male also possess an pair of vocal sacs that they use to seduce the female in the breeding season that start has early has the ice melt in march or April in order to reproduce. Eggs are laid in water temperatures averaging 10C in bunches, attached to underwater plants and rock, up to 2500 eggs that will give birth to tadpoles after a average period of about 21 days which would evolve into small baby from after about 2 to 3 months. Wood frog are the only specie of poikilothermic tetrapod north to Artic circle of North America. Poikilothermic animals can support a wide range of variation in their body temperature. 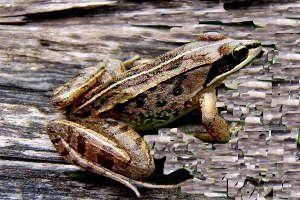 This characteristic and because they produce their own antifreeze, mostly glucose that allows the wood frog that are distributed in the north of Canada to hibernate under rocks or logs only covered by some thin isolation layers. Wood frogs are mostly terrestrial and are usually found in woods and forest which allows them to find the humidity and ponds needed for their reproduction process. Wood frogs male only call female during the breeding season while really quiet during the rest of the year probably to stay hidden from their predators while hunting their favorite preys insects and small arachnids..